A sea of retro Liverpool 80s-style perms were on show as thousands took to the streets to take part in the Echo Scouse 5k fun run. Nearly 4,000 enthusiasts attended on Sunday to run or walk their way around famous city locations, such as the Philharmonic Hall and the Cavern club. Drummers were at the start line at St George’s Hall to entertain the crowd while the organisers waited for confirmation to begin the run. The roads in town were closed for the event to take place, but they were quick to reopen to allow traffic to flow as normal after the conclusion. Matthew Davies organised the race by himself and he told JMU Journalism: “I like to think that people might take part in the Scouse 5k as a laugh but then go on to walk a bit more, or jog a bit more or go to the gym a bit more. “I wanted to organise an event that was fun and thought if people were wearing wigs it might attract people who had never taken part in a 5k before. All levels of runners were welcome, with many of the participants raising cash in support of their chosen charities, and some even wore fancy dress to make for an amusing start to the morning. 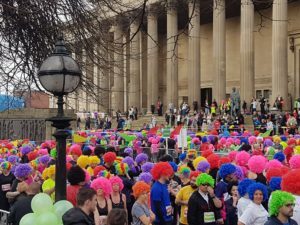 The popular 5k fun run will be back next year and will continue to grow, with more willing to don the colourful wig and make their way around Liverpool.